I was introduced to your book, GO GREEN, LIVE RICH, at the “Women’s Health and Environment” Conference in Pittsburgh this year. After immediately implementing some “Green” cost saving ideas from you book, and seeing the difference, we walked to the library (to save on gas) and picked up THE AUTOMATIC MILLIONAIRE. I do believe your book will change our lives! Soon after, we read START LATE, FINISH RICH. I am now reading SMART COUPLES FINISH RICH. In just a few months we have made many positive changes. To name a few; we set up our mortgage payments to be “automatic”, with extra being paid each month. We managed to pay off several high interest credit cards. 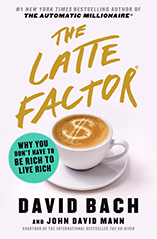 We have analyzed our “Latte Factor” and found many areas where we reduced our spending. With that savings, my husband plans to increase his 401K contribution from 4% to 10%, and I plan on opening a new IRA, with “automatic” contributions of course! Thanks to your books, we have much less stress!